Carol Coletta, of CEOs for Cities, and Damon Rich, Center for Urban Pedagogy, will keynote the first-ever conference of the Association of Architecture Organizations and the Architecture + Design Education Network, taking place in Chicago, November 5-7. The conference, whose theme is Architecture & Design as a Catalyst for Change, is for architects, design professionals, architecture centers and other built environment organizations interested in educating the general public about architecture and design. 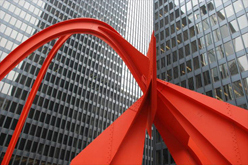 It will be held at the Chicago Architecture Foundation, in the heart of downtown Chicago. Don’t miss the special session: “A Conversation with the Critics: Imagining the Future of the City.” Panelists include Jonathan Glancey, The Guardian; Paul Goldberger, The New Yorker, Sarah Williams Goldhagen, The New Republic; and Blair Kamin, Chicago Tribune; moderated by Edward Lifson, cultural critic and creator of Chicago Public Radio’s Hello Beautiful! The Association of Architecture Organizations (AAO) is a nonprofit membership organization dedicated to fostering a strong network of organizations that engage and educate the public about the built environment. It pursues this mission through conferences and workshops, a membership network, the sharing of best practices, and peer-to-peer learning. A+DEN, an affiliate of AAO, was formed in 2005 and is dedicated to fostering the growth and development of architecture and design education on a national level. The Architecture + Design Education Network (A+DEN) further strives to raise youth awareness about the built environment and advance the integration of the design process across the K-12 curriculum. A+DEN is a partnership of the Chicago Architecture Foundation, the American Institute of Architects, and the American Architectural Foundation.